1Department of Obstetrics and Gynaecology, Sultan Qaboos University, Muscat, Oman. 2Department of Family Medicine and Public Health, College of Medicine and Health Sciences, Sultan Qaboos University, P.O. Box 35, 123 Al-Khod, Sultanate of Oman. Department of Family Medicine and Public Health, College of Medicine and Health Sciences, Sultan Qaboos University, P.O. Box 35, 123 Al-Khod, Sultanate of Oman. Al-Khaduri MM, Abudraz RM, Rizvi SG, Al-Farsi YM. Risk Factors Profile of Shoulder Dystocia in Oman: A Case Control Study. Oman Med J 2014 Sep; 29(5):325-329. Results: Dystocia was significantly associated with older maternal age, higher parity, larger BMI, diabetes, and previous record of dystocia. 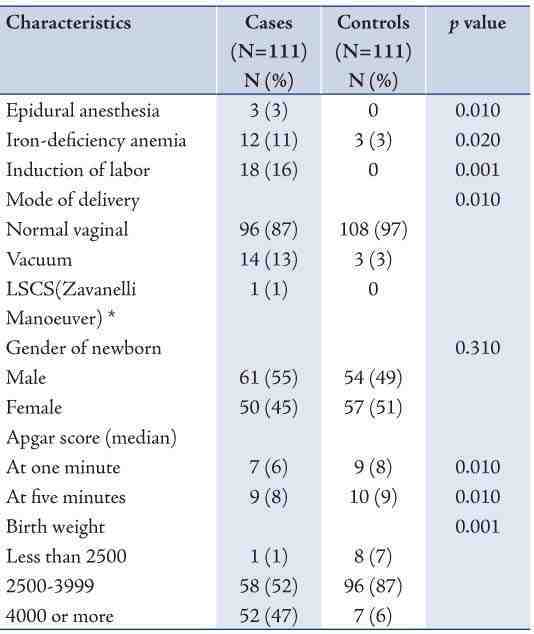 In addition, dystocia was associated more with vacuum and forceps deliveries. Routine traction (51%) was the most used manoeuvre. Among dystocia cases, 13% were associated with fetal complications of which Erb’s Palsy was the most prevalent (79%). Shoulder dystocia (SD) is defined as a prolonged head-to-body delivery time of more than 60 seconds or the need for ancillary obstetric manoeuvres.1 In general, literature reviews report the incidence of SD to ranging from 0.2% to 3%.2 In the international literature, several risk factors have been reported to be associated with SD.3-5 These factors include: previous SD, fetal macrosomia, diabetes mellitus, maternal body mass index (BMI) >30 kg/m2, induction of labor, prolonged first stage of labor, secondary arrest, prolonged second stage of labor, oxytocin augmentation and assisted vaginal delivery. While numbers of studies have been conducted on these separate conditions, very few have measured the prevalence and socio-demographic factors related to SD as a whole. This is in despite of the fact that some of the serious outcomes of SD are brachial plexus injuries and stillbirth. In spite that medical literature affirms associations between SD and certain risk factors, SD can be anticipated only rarely, as many occur in the absence of identifiable risk factors. Therefore, it is quite important to work out the risk profile of women who are likely to have SD, so it will help in recognizing SD early enough to minimize risk to the mother and fetus. It is particularly important to investigate SD in Oman, as worldwide, Oman has one of the highest prevalence rates of both diabetes mellitus,6 and fertility rate.7 Over the last four decades, Oman has witnessed a rapid improvement in healthcare services in general, and maternal and child health in particular. Nonetheless to date, the risk factors for SD have not been documented. Thus, the objective of this study was to explore the risk factors profile of SD among Omani women, and their obstetric management and neonatal outcomes. This is a retrospective case control study conducted on the records of deliveries of Omani women who delivered over the period of January 1994 to January 2006 at Sultan Qaboos University Hospital (SQUH), a tertiary care hospital in Oman. The research assistants screened the delivery registry at SQUH during the study period and prepared a list of all deliveries which were labeled to have SD. A case was defined as any woman who had vaginal deliveries complicated by SD which was based on a clinical diagnosis entered at birth. SD deliveries at SQUH are usually attended by a senior obstetrician trained in the management of SD. The delivery date of a case was taken as the index to randomly select an appropriate control woman. Therefore, controls were randomly selected among women who did not have SD and delivered on the same date of delivery for a case. The case to control ratio was 1:1. Information about data related to potential risk factors, delivery and complications was collected. Socio-demographic and clinical characteristics of cases and control subjects such as age, parity, gestational age, Body Mass Index (BMI), gestational diabetes mellitus (GDM) and previous SD were collected before delivery as well. The main outcome measures included risk factors, and ante- and perinatal complications. Statistical Package for Social Sciences (SPSS) software was used for data analysis. Student’s t-test (two-tailed) was used to determine the significance of difference between two continuous variables and confirmed by non-parametric Mann-Whitney test. Chi-square analyses were used to evaluate the statistical significance of differences among proportions of categorical data. The Fisher’s exact test (two-tailed) replaced the Chi-square test if the assumptions underlying Chi-square was violated, namely in case of small sample size and where the expected frequency is less than five in any of the cells. A p-value of <0.050 was used for all tests of statistical significance. The study protocol was evaluated and approved by the Medical Research Ethics Committee at Sultan Qaboos University. Overall, 111 cases from a total of 19,878 pregnancies that belonged to Omani women were enumerated over the period of the SD study. Therefore the hospital-based prevalence of SD among Omani women was 1%. Table 1 shows the socio-demographic and antenatal characteristics of SD cases compared to controls. Both cases and controls had comparable age distribution with the majority in their second and third decades. More primiparous women were among controls compared to cases, while cases group included more women with extreme (nine or more) parity and differences were statistically significant. Compared to controls, cases had more advanced gestational age and greater BMI. Gestational diabetes mellitus and high BMI were both significantly higher among cases compared to controls. Previous record of SD was only reported among case group. 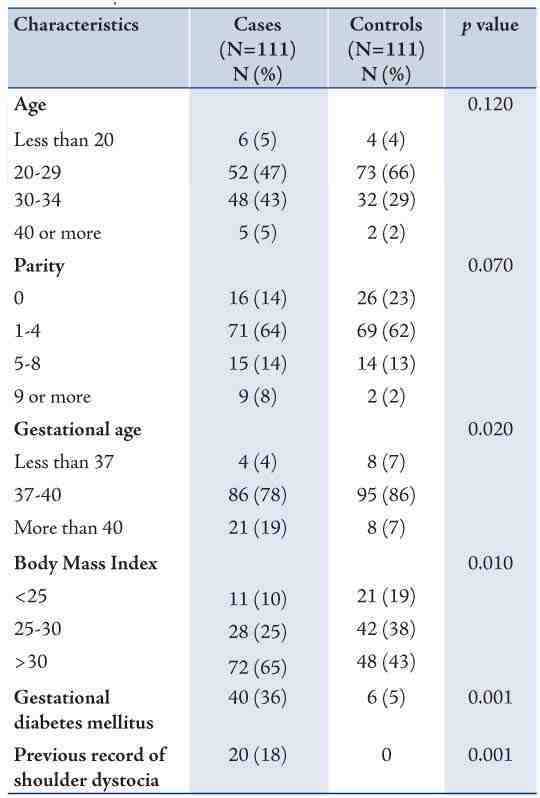 Table 2 shows the perinatal characteristics of SD cases compared to controls. Epidural anesthesia and induction of labor were reported only among cases. More iron-deficiency anemia was also reported among cases. Proportion of deliveries conducted by vacuum among cases (13%) was significantly higher than those among control group (3%). Only one case was reported where Lower Segment Cesarean Section (LSCS) after Zavenelli manoeuvre was conducted. Overall, cases tended to have a lower median Apgar score. Low birth weight occurred more among controls, while a greater proportion of newborns with macrosomia was among cases compared to controls. The differences were statistically significant. Table 2: Perinatal characteristics of cases of shoulder dystocia and their controls, Oman, 2010. * Zavanelli Maneuvers: Cesarean Section after the head has delivered and was pushed back into the perineum. Table 3 shows some indicators of obstetric management of shoulder dystocia cases and their associated complications. The most common obstetric manoeuvre of SD was Routine traction, followed by McRoberts, Suprapubic pressure + McRoberts, and then delivery of the posterior shoulder. More than one manoeuvre may have been used in a case of SD. The most common complication reported with SD was Erb’s palsy. Only two cases of birth asphyxia and one case of stillbirth were reported. Out of 17 cases of Erb’s palsy, 15 cases were resolved while 2 cases persisted. Also gestational diabetes mellitus was reported among 8 cases of Erb’s palsy. 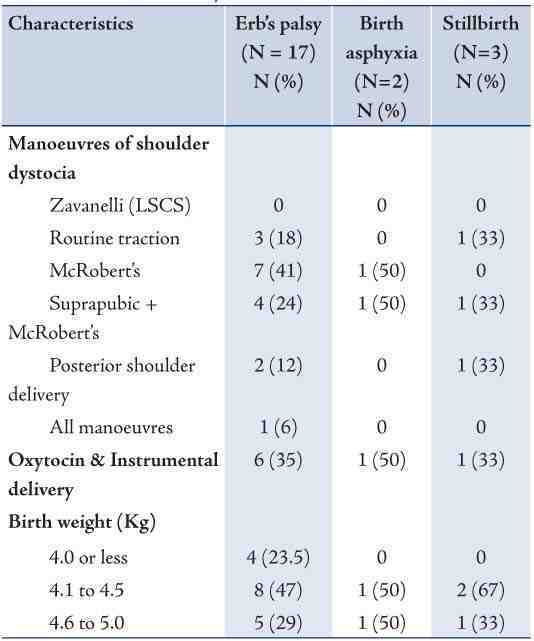 Table 3: Management and complications of cases of shoulder dystocia, Oman, 2010. * More than one manoeuvre may have been used in a case of SD. Table 4 shows the characteristics of cases of Erb’s palsy, birth asphyxia, and stillbirth among women who had SD. Overall; there were 17 cases of Erb’s palsy, 2 cases of birth asphyxia, and 3 stillbirths. The most common manoeuvre among cases of Erb’s palsy was McRobert’s (41%) followed by Suprapublic + McRobert’s (24%), and then routine traction (18%). These two maneuvers were also the ones associated with cases of birth asphyxia and stillbirth. Only one case of stillbirth was associated with posterior shoulder delivery. Oxytocin with instrumental delivery was reported among 35.3% of cases of Erb’s palsy, and with one case among each of birth asphyxia and stillbirth cases. The Majority of newborns with Erb’s palsy were macrosomic (birth weight exceeds 4.0 kg), and among them 29.4% had birth weight that exceeded 4.5 kg. All cases with birth asphyxia and stillbirth were macrosomic. 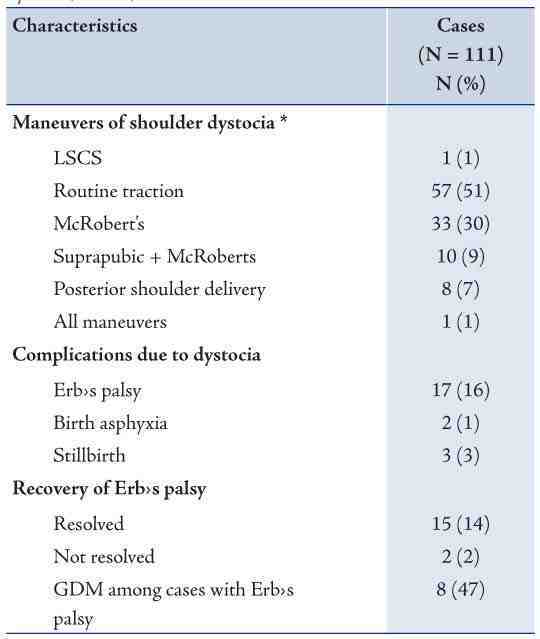 Table 4: Characteristics of cases of Erb’s palsy, birth asphyxia and stillbirth due to shoulder dystocia, Oman, 2010. Although our finding of a positive association between SD and high BMI has already been reported in other studies, this observed association can be entirely confounded by other factors. Some studies have reported that high maternal body mass index (BMI) and excessive weight gain during pregnancy are risk factors for SD,8 while others have not found this association after adjusting for confounding variables.9,10 For example, one study observed that massively obese (greater than 300 lbs or 136 kg) pregnant women had a significantly higher incidence of macrosomic infants (birth weight greater than 4000 g) than control women matched for age and parity (30% and 11%, respectively).11 However, obesity was not an independent risk factor for SD when the data were corrected for medical complications of obesity, such as diabetes. The finding that a positive history of SD was only reported among cases confirms the finding that SD tends to be repetitious. The incidence of recurrent SD has been reported to be 1 to 25 percent.12 The risk for repeated SD in this group was 21% (SD divided by number of multipara) which was higher than in most series. However, in most series the majority of women had 2-3 children while in Oman parity is much higher and probably some of these women had both uncomplicated delivery and SD in different births following the initial SD. Our finding of increased perinatal and postnatal risks corroborates the findings of previous studies in the region. A similar case-control study in Kuwait showed that SD cases had a higher incidence of previous SD, diabetes mellitus, operative vaginal deliveries, and rate of sustained birth injuries than controls.13 Omu and colleagues also conducted a study on 1430 cases of SD in Kuwait. It was concluded that SD continued to pose a challenge in Kuwait, and they called for more rigorous policies to reduce macrosomia including rigorous control of gestational diabetes. Melendez and colleagues conducted a case control study on babies that sustained brachial plexus injuries versus babies born without complications.14 They found that brachial nerve injuries and skeletal fractures were more likely to occur in mothers with gestational diabetes or who had big babies on previous deliveries. Babies who had birth injuries were also more likely to have greater median birth weights and postnatal anthropometric measurements. Our data supports the need for early preventive actions during the antenatal period in order to avoid occurrence of SD. The increased risk of SD observed with gestational diabetes mellitus and macrosomia necessitates the need for strict control of blood sugar during the antenatal period. Currently, the rate of gestational diabetes in Oman is expected to range from 5-8%.15 Several studies showed that pregnancies complicated by pre-gestational and gestational diabetes were found to be associated with higher rates of fetal macrosomia and increased neonatal shoulder-to-head size difference, thereby increasing the risk of SD independent of fetal weight.16,17 Macrosomic infants of diabetic mothers were characterized by larger shoulder and extremity circumferences, a decreased head-to-shoulder ratio, significantly higher body fat, and thicker upper extremity skinfolds compared with nondiabetic control infants of similar birth weight and birth length. In addition, maternal diabetes mellitus was found to be associated with 2-6 fold increase in likelihood of SD compared to non-diabetic mothers.18 In a retrospective review aiming to determine the effect of extreme macrosomia on perinatal outcome 49 cases that underwent vaginal deliveries were complicated by 10 (20%) cases of SD and 3 (6%) of Erb’s palsy. Permanent Erb’s palsy was noted in only 1 of these 3 cases. SD was associated with use of oxytocin and instrumental deliveries.19 The data collected in this study also showed that the majority of cases complicated by Erb’s palsy, birth asphyxia or stillbirth were associated with macrosomia in addition to the use of oxytocin and instrumental delivery. Some procedures that might be helpful in early detection of SD, especially among vulnerable groups have been proposed. Among these, assessment of abdominal circumference and biacromial length by magnetic resonance imaging (MRI) has been proposed,14 which might help predict the likelihood of severe SD. Such recommendations would require more rigorous studies in order to establish their efficacy. Several limitations of this study must be acknowledged. The sample size was relatively small, and the inference has been made on retrospective data. Newborns of women with diabetes are at high risk of SD during delivery because they are more often macrosomic than newborns of women without diabetes. Women with suspected fetal macrosomia, labor abnormalities, and operative vaginal delivery are at particularly high risk of SD. Our finding of significant associations with risk factors lays out the ground to develop a predictability index for SD, which would help in making it preventable. Further population-based prospective studies on large sample sizes are required to confirm these findings. 1. Spong CY, Beall M, Rodrigues D, Ross MG. An objective definition of shoulder dystocia: prolonged head-to-body delivery intervals and/or the use of ancillary obstetric maneuvers. Obstet Gynecol 1995 Sep;86(3):433-436. 2. ACOG Committee on Practice Bulletins-Gynecology, The American College of Obstetrician and Gynecologists. ACOG practice bulletin clinical management guidelines for obstetrician-gynecologists. Number 40, November 2002. Obstet Gynecol 2002 Nov;100(5 Pt 1):1045-1050. 3. Dildy GA, Clark SL. Shoulder dystocia: risk identification. Clin Obstet Gynecol 2000 Jun;43(2):265-282. 4. Moore HM, Reed SD, Batra M, Schiff MA. Risk factors for recurrent shoulder dystocia, Washington state, 1987-2004. Am J Obstet Gynecol 2008 May;198(5):e16-e24. 5. Usta IM, Hayek S, Yahya F, Abu-Musa A, Nassar AH. Shoulder dystocia: what is the risk of recurrence? Acta Obstet Gynecol Scand 2008;87(10):992-997. 6. Al-Farsi YM, Brooks DR, Werler MM, Cabral HJ, Al-Shafei MA, Wallenburg HC. Effect of high parity on the occurrence of prediabetes: a cohort study. Acta Obstet Gynecol Scand 2010 Sep;89(9):1182-1186. 7. Al Riyami A, Afifi M, Mabry RM. Women’s autonomy, education and employment in Oman and their influence on contraceptive use. Reprod Health Matters 2004 May;12(23):144-154. 8. Hope P, Breslin S, Lamont L, Lucas A, Martin D, Moore I, et al. Fatal shoulder dystocia: a review of 56 cases reported to the Confidential Enquiry into Stillbirths and Deaths in Infancy. Br J Obstet Gynaecol 1998 Dec;105(12):1256-1261. 9. Gemer O, Bergman M, Segal S. Labor abnormalities as a risk factor for shoulder dystocia. Acta Obstet Gynecol Scand 1999 Sep;78(8):735-736. 10. Melendez J, Bhatia R, Callis L, Woolf V, Yoong W. Severe shoulder dystocia leading to neonatal injury: a case control study. Arch Gynecol Obstet 2009 Jan;279(1):47-51. 11. Perlow JH, Morgan MA, Montgomery D, Towers CV, Porto M. Perinatal outcome in pregnancy complicated by massive obesity. Am J Obstet Gynecol 1992 Oct;167(4 Pt 1):958-962. 12. Robinson H, Tkatch S, Mayes DC, Bott N, Okun N. Is maternal obesity a predictor of shoulder dystocia? Obstet Gynecol 2003 Jan;101(1):24-27. 13. Gherman RB, Chauhan S, Ouzounian JG, Lerner H, Gonik B, Goodwin TM. Shoulder dystocia: the unpreventable obstetric emergency with empiric management guidelines. Am J Obstet Gynecol 2006 Sep;195(3):657-672. 14. Bahar AM. Risk factors and fetal outcome in cases of shoulder dystocia compared with normal deliveries of a similar birthweight. Br J Obstet Gynaecol 1996 Sep;103(9):868-872. 16. Modanlou HD, Komatsu G, Dorchester W, Freeman RK, Bosu SK. Large-for-gestational-age neonates: anthropometric reasons for shoulder dystocia. Obstet Gynecol 1982 Oct;60(4):417-423. 17. McFarland MB, Trylovich CG, Langer O. Anthropometric differences in macrosomic infants of diabetic and nondiabetic mothers. J Matern Fetal Med 1998 Nov-Dec;7(6):292-295. 18. Langer O, Berkus MD, Huff RW, Samueloff A. Shoulder dystocia: should the fetus weighing greater than or equal to 4000 grams be delivered by cesarean section? Am J Obstet Gynecol 1991 Oct;165(4 Pt 1):831-837. 19. Alsunnari S, Berger H, Sermer M, Seaward G, Kelly E, Farine D. Obstetric outcome of extreme macrosomia. J Obstet Gynaecol Can 2005 Apr;27(4):323-328. 20. Campbell MK, Ostbye T, Irgens LM. Post-term birth: risk factors and outcomes in a 10-year cohort of Norwegian births. Obstet Gynecol 1997 Apr;89(4):543-548. 21. Gross SJ, Shime J, Farine D. Shoulder dystocia: predictors and outcome. A five-year review. Am J Obstet Gynecol 1987 Feb;156(2):334-336. 22. Rodis JF, Lockwood CJ, Barss VA. Intrapartum management and outcome of shoulder dystocia. In: UpToDate, Basow, DS (Ed), UpToDate, Waltham, MA, 2012. 23. O’Leary JA, Leonetti HB. Shoulder dystocia: prevention and treatment. Am J Obstet Gynecol 1990 Jan;162(1):5-9. 24. Gurewitsch ED. Optimizing shoulder dystocia management to prevent birth injury. Clin Obstet Gynecol 2007 Sep;50(3):592-606. 25. Ouzounian JG, Gherman RB. Shoulder dystocia: are historic risk factors reliable predictors? Am J Obstet Gynecol 2005 Jun;192(6):1933-1935, discussion 1935-1938. 26. Al Busaidi I, Al-Farsi Y, Ganguly S, Gowri V. Obstetric and non-obstetric risk factors for cesarean section in oman. Oman Med J 2012 Nov;27(6):478-481. 27. Gasim T. Gestational diabetes mellitus: maternal and perinatal outcomes in 220 saudi women. Oman Med J 2012 Mar;27(2):140-144. 28. Al-Mujaini A, Al-Farsi Y, Al-Maniri A, Ganesh A. Satisfaction and perceived quality of an electronic medical record system in a tertiary hospital in oman. Oman Med J 2011 Sep;26(5):324-328.